My pregnant niece invited me to accompany her to her OB/GYN appointment Wednesday afternoon. Imagine my excitement when thinking of the ultrasound they were going to do that day!! We shared a moment together. Not just ANY moment. The most special moment EVER when we saw the silhouette of her precious baby appear on the screen!! My niece was trying to contain her excitement, but when I started saying “Oh my gosh …” it was almost as if she found freedom to release what she was feeling also. She followed with a much louder, “OH MY GOSH …” and lots of giggles … and at that moment, tears escaped from the outside corners of my eyes. 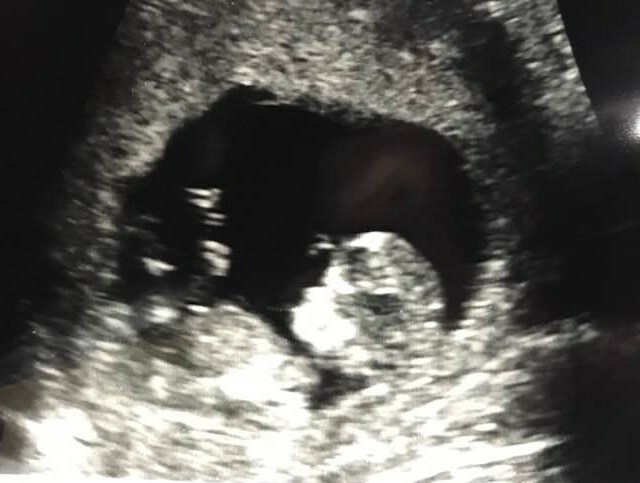 We saw and heard the baby’s heart beating, and we were wrapped in a blanket of joy beyond measure. Three months pregnant … with already a perfect little nose that appeared on the screen … with what looks to be hair already! Our thoughts ran wild about what the baby will look like … obviously it’ll have darker skin and black hair because we imagine the Mexican genes of her boyfriend will be strong. That is okay, as long as the baby looks just like our side of the family. ~grin~ No matter what, this baby is going to be beautiful and absolutely spoiled beyond belief! And a priceless moment shared with my niece!